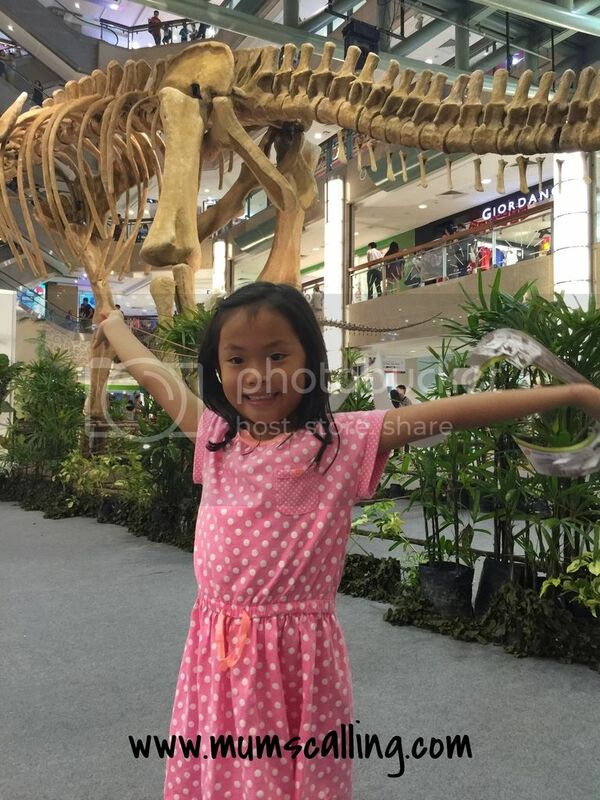 We discovered the lost world of dinosaurs, not in Jurassic Park, but Plaza Singapura! 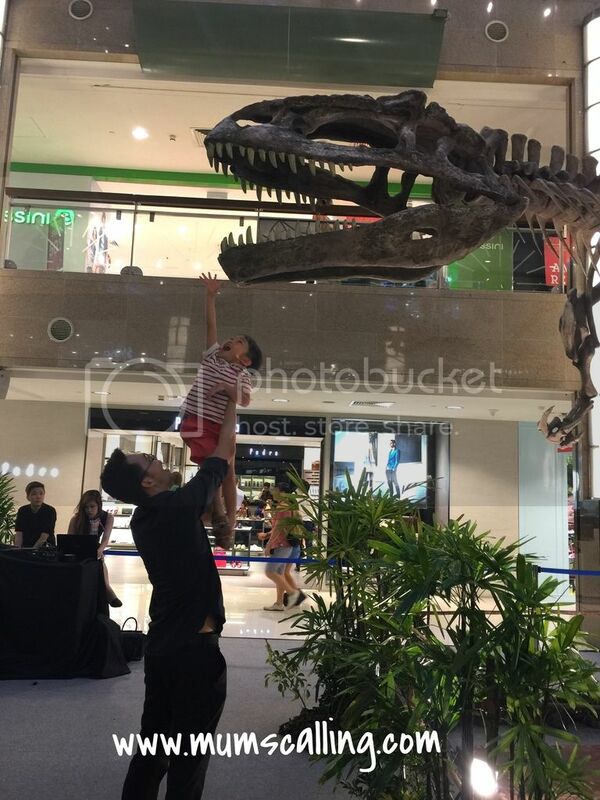 The mall had just unveiled a 37m by 7m Argentinosaurus exhibit. Just by imagining its size, you'll probably go, "Wow, colossal!" Yes, its one of the world's largest dinosaur exhibit and the largest ever in our local mall. With a boy so crazy over dinos, I knew we had to go! 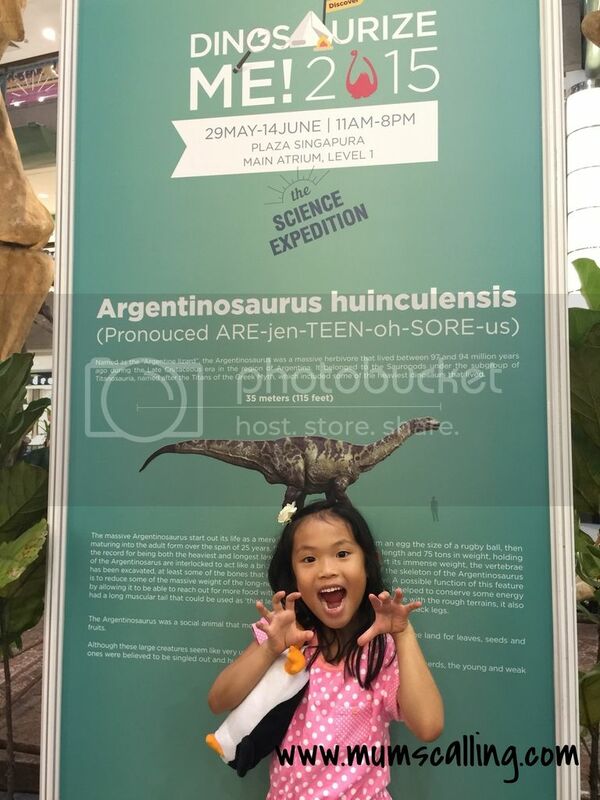 "Dinosaurize Me" is a two-week exploratory adventure held in partnership with Science Centre Singapore. For once, Science centre moved out of the west. Featuring dinosaur-themed art workshops, Science shows, and a digging pit with fossils waiting to be uncovered by little paleontologist. In the dino fun zone, little hands will work on fossils crafting using clay, as well as using everyday materials to construct and re-create the extinction of dinosaurs! Creativity and imagination never fail to get to work in those little minds. Or how about constructing a geological timeline while discovering the history of dinosaur? Js had their go with the geological timeline in the dino fun zone. Head on down to ignite that curiosity and desire to understand the science behind their existence and extinction! Fee: Entrace to exhibition and Science show is free! Admission to each dino fun zone is priced at $5 per entry. Disclaimer: Media invite. All opinions and photos are solely ours. Aviva Superfundae - Family carnival not to be missed! Aviva Superfundae is a brand new family carnival concept blooming this June, on the sprawling grounds of The Meadow at Gardens by the Bay! This one-day Funival is aimed to unite families outdoor with heedless fun. It will be one mega fun for every young to old member in the family. Games and fun dashes such as piggy back, skates scooter mini-races, milk dashes and beer dashes for the grown ups who wish to down a glass of beer. Kids can also have a go at being a ninja with timed, multi-challenge obstacle course. If your child is above 8 years old, he may polish his shots on a nerf mission while going on an adventure of accuracy and speed game. For the younger ones with us, we can have a go on the transformers challenges, with a chance to catch glimpse of Bumble Bee! Prefer some quieter moments? Get your hands on with the various art and craft workshops. Release your creativity at the various workshops - Make your own play dough, make soap clay or even create a giant portrait together as a family! One that you can proudly bring home for hang. Families may join in for some speech and drama imaginative fun too. Or if not, explore the creativity of moving freely at the mass dance lesson. There's a party animal in every child and a groovy body in that grown up, you. Reward the kids with water play if they would like to get soaked. Do pack in their wet suit, parents! Have a go too, with foam boomerangs and frisbees throwing. You will probably walk away with some tips on foam throwing and wind. Candy cannon is probably another highlight that's gonna send kids crazy with gummies firing at every hour! Apart from this hourly temptation, there will also be much fun with foam blocks and bubbles. What's more?!! After a long exhausting day of fun activities, indulge in a huge array of food from Pasarbella and get entertainment from local favourite bands, 53A and PennyLane. 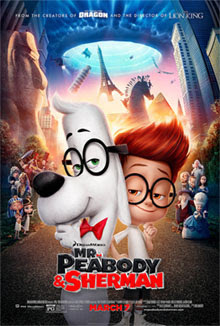 End the day with movie, Mr Peabody and Sherman. It's probably the best way to tame the wild in us. Lay those picnic mats (included in Superfundae pack) and relax while watching on the giant outdoor screen. Time: All day long from 10am to 9pm! 7:15 pm: Starts Movie screening. Ends all activities. Be highly warned of an overflowing and exciting day of fun! 2. Leave me a comment on this Facebook post, telling me which activity excites you most. 3. Together with your comment, tag a friend or more on the whom you think will be keen on this event and giveaway. 4. 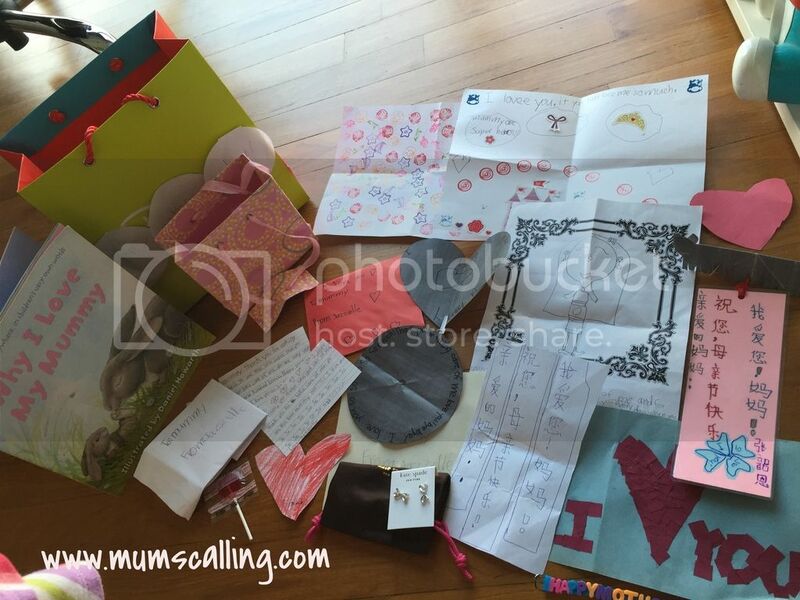 Finally, you don't have to, but we would love having you with us on instagram, follow @mumscalling for an additional chance to winning (Leave me your instagram user on comment). This giveaway has closed. Thank you everyone, for your participation! A final keeper had been picked with random.org. Congrats Jazry C! It's nearing the awesome weekend again. How about another frugal weekend to the museum? This round, the Singapore Philatelic Museum (SPM)! Free entry for all Singaporeans and PR. The word Philately, a greek word means "love" and "paid" or "tax free." Which means an avid collector of stamps. Stamps are symbols that postage or tax has been paid, they are icons of a society's culture, people, history and development. So yeap, there's a story in every piece of stamp. A place that houses these treasure and stories is naturally called the Philatelic Museum. 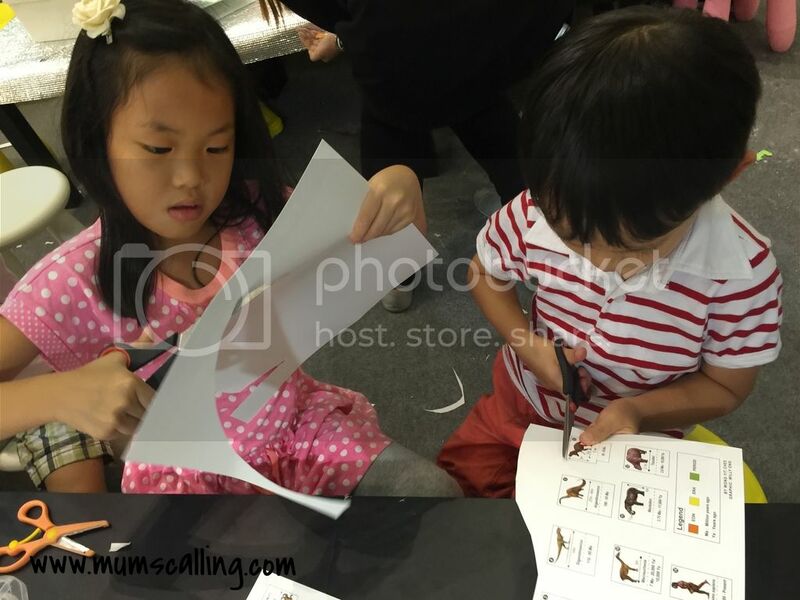 It promotes the educational use of these materials to learn about history and heritage of Singapore, and the world. We hunted it down and had some good fun within. Officially opened in 1995, but it was our first visit there. For the grown ups, you'll find it very much nostalgic. While the little ones will experience it with a refreshing perspective. That mailbox is still in use today!!! It showcases one of the most wide-ranging collections of Singapore stamps and philatelic items. Begins simply by explaining what a stamp is, it's history and the showcase of various local mailboxes that gestated along the years. We also discovered famous philatelists from around the world and local collectors who have put Singapore on the world philatelic map. We learned about the world's first stamp, as well as looking through the bountiful collections of local stamps from its earliest days to the most recent. My man used to be an avid stamp collector, it was one he could most identify with. My childhood memory of Mr Postman! Modern stamp will look like this! On the same level, we rocked and rolled into the world of Elvis. Yes, Elvis Presley. No idea how it's related to Philately, but it blended well with the nostalgic mood we carried. Not that we were people of his era, but we do have a few familiar songs in our head. The exhibit displayed a list of Elvis' related items by a private collector and it was really exhaustive! Exhibition till 01 Jul 15. Room of Rarities is dedicated to our local rich postal history. The gallery displays some of the largest, finest and most comprehensive philatelic items. A highlight is the much sought after cover that bears all four values of the first set of stamps to be introduced in Singapore in 1854. A gallery with much reading and knowledge. The Heritage room next to it has a rich highlight of our past immigrants. The room is designed to resemble that of a 'shophouse' in the past, illustrating the background and culture of Singapore's migrant races. It was interactive and engaging. Most items on display allowed the sense of touch, for the feel of turning back time. Js were so excited to walk on clogs! Counting sheep, Dreaming goats, children's exhibition located on level 2 as well. This fun and interactive exhibition brings children into the fluffy world of goats and sheep. Held in conjunction with the year of goat or sheep, it introduces these domesticated animals from different cultures, and admire goat and sheep themed stamps from around the world. You guessed it, the room we spent most time in because Js had too much fun discovering these four-legged animals. They learned the terms we name a male, female and young of a goat and sheep, as well as their diet through some hands on play. They discovered too, the importance of these animals giving us meat, milk, wool and skin. There was a little toy piano with a displayed set of 'sheep' related songs, 'Ba ba black sheep' and 'Mary had a little lamb'. Little ones can have a go on it too! Counting sheep, Dreaming goats exhibits till 27 September 2015. Last of all, we walked through the journey of spice is nice, also nostalgically located on level 2. A vast display of spices used by various ethnic groups and for trade in the past. The kids learned much about using spice as remedies as well as knowing the types of food different races savour. It was an interactive and interesting place of spice and racial knowledge. Have you once visited the Singapore Philatelic Museum? If not, you should not miss its OPEN HOUSE on 31 May 2015, Sunday and 07 June 2015, Sunday! Suitable for all ages. Fun and free activities begin from 10am all the way to 5pm. Programme highlight here. It was a beautiful Monday, the man went on a pre-planned date with the boy. 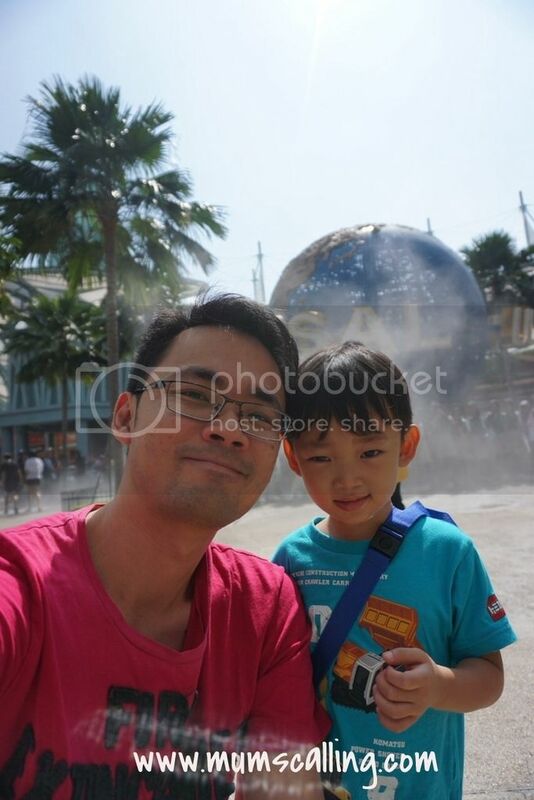 They drove off excitedly to the theme park for an exclusive day of Daddy and son outing. Jazz had hers with me last month. It was Jare's deal that day. Jazz gladly told him to have fun and made her way to school. They spent an almost full day and much exciting moments at the park. Theme parks never fail to send kids smiling anyway. When they got home in the evening, I asked my son about his fun day out. He exclaimed, "It was so fun, we did so many rides!" So over dinner, I interrogated for details. He went on to say he doesn't like to go with Daddy next time, with those cutely pouted lips. I curiously dug for details. Son: I don't want to eat, I want to go home and eat. Daddy: Then don't eat and don't play. I know men are quite direct in nature, sometimes speaking like an officer in the military. But I probably wouldn't say that. One thing about Js these days, they are extremely homely. They love home cooked meals! Pat on myself. I would prefer to say something like, "I know you would love to eat home, but there's no lunch home, Mummy didn't cook. This chicken rice looks really yummy! If you choose not to eat, we won't be able to have fun after this"
Acknowledge and understand concerns, explain, entice and give choices. There's probably higher chance of whine free cooperation this way. Daddy: Haha. Told you to eat more. Palms smacking forehead! That must have hurt his little ego, "ouch!" I would go like, "That's alright Jare, we can try again next time when you grow a little taller. Let's go for something else." Acknowledge and comfort his feelings, encourage with love and focus on alternatives! He probably knows by now, Mummy is a better comforter. Man man man, it's no wonder he was quite complaining about his date with Daddy. Choice of words are highly essential to our little ones, isn't it? In midst of our busy life or habitual parenting style, we should always remind ourselves to use positive language when speaking to our child. Sometimes lengthy conversations because they do deserve our attention. I know our daily mood plays a big part. That being said, I think it's quite my man's nature. That's the typical difference between the Daddy in him and Mummy in me. What's the style in your family? I do think they've got an interesting fun day out. I need to applaud the man though, for making this promised date a come true. It was within hours after touching down from an overseas trip. His lethargy might have been part of the culprit. Thanks for making Jare's day still enjoyable! How about more dates, Daddy? It's Friday! I'm chapter-ing the places we can explore for free or at a very low cost, just to be kind to our pockets. Fun doesn't often come with monetary outlay. Let me begin with Museums. There are a couple of museums locally that Singaporeans can enter for free. A pat on yourself if you knew about this. All you would need to do is, bring your IC along. Singapore Arts Museum (SAM) is one of them. It focuses on contemporary art practice in Singapore, Southeast Asia and Asia within the global context. Some weeks ago, we visited its exhibition, 'Medium at large' which is now exhibited over by "After Utopia: Revisiting the Ideal in Asian Contemporary Art." (From 01 May to 18 October 2015). Drawing largely from SAM’s permanent collection, as well as artists’ collections and new commissions, After Utopia seeks to ask where have we located our Utopias, and how we have tried to bring into being the utopias we have aspired to. Sounds like something really cool to explore. In exploring exhibits, I was quite concern if Js would stay patient with us as we journeyed through the galleries. Thankful enough that they seem to know how to admire and appreciate the displays around. Perhaps, something much different from our daily lives. After which, we rewarded the kids at the other wing of SAM, SAM at 8Q (A short stroll from SAM's main building). We did 'Imaginarium, A voyage of Big Ideas', for everyone and anyone with a head for ideas and heart for adventure. A launch by SAM to celebrate Singapore's 50th birthday. Very much of good suit for our little ones. Here's what you can expect on your Imaginarium journey. Interactive, immersive artworks with plenty of hands-on activities to keep the kids occupied. Looking like a giant playground that invites children to be architects, builders and master planners of their housing estate and city skyline. The layout is very much made to our local sightings. With housing blocks designed like giant Tetris pieces, little ones are free to create whatever they can imagine. On the same level, you can find an installation comprising glass boxes filled with parts of a tree that had been chopped down to make way for redevelopment. Reminding us how nature often exists in controlled environments in cities such as Singapore. This is where doodling is extraordinarily allowed on walls and a room to keep one occupied on a long journey to the Moon. The kids had fun doodling and penning their letters to the Moon. There is even a moonbox to transmit those letters! Jazz asked Mr Moon if he was really made with cheese and Jare apparently wrote some moon language that humans won't know. I really loved how their imaginations ran wild in there. A room more suit for older kids. Displays of bicycles, generators, LED and stereo equipment which are activated only through interaction between the artwork and visitors. Sewing and embroidery are meaningful and symbolic ways of enfolding time as well as the creativity and actions of the maker. Visitors are invited to create small objects using textiles, which capture their thoughts about the future of the country. Here, visitors get a taste of weaving, making pom pom and cross stitching. Filling a house with candy that visitors are invited to take and 'plant' in a garden. Definitely a sweety place of a child's wishes and desires to sow and harvest candies. No, you can't eat them. It's a delightful space where the inner wishes for the future can be projected and encouraged to flourish. Broaden the mind by entering the magical world's hidden within three secret boxes and beyond. In this work inspired by the wonder that children experience as they explore world around them, it seeks to recreate these sensations for both young and old alike. Js love the wall puzzle, not quite easy as seen. Takes some patience, but interestingly fun! Get your weekend filled if you've not visited SAM! Imaginarium, A voyage of Big Ideas journeys from 14 March to 19 July 2015. Definitely a fun and budget way to spend fun moments with our family. We visited on a weekend and most nice that it wasn't overly crowded. More information on Imaginarium here. Are there turned down decisions made, which often fall under the spell of a worrying mind? Worrying is inevitable. If I can, I would like to sum it to our local way of saying, "You worry too much, you lugi " (I think I should have a trademark for that). Plainly, too much reservations, you lose out. Being a worrier doesn't change a thing, it does not equate to love or adds more love. It could simply rob us of an opportunity to further explore our desires. I was one Mum who worried too much and too often. Along the years, I discovered the beauty of letting worry go, in trade for a freer mind. Easier said than done, I know it's almost impossible to get on the worry free mode all the time. I know what Mums think, and I can identify. We worry endless about our kids, their schedule, academics, choices, peers, milestones and all sorts of aspects in a growing child. 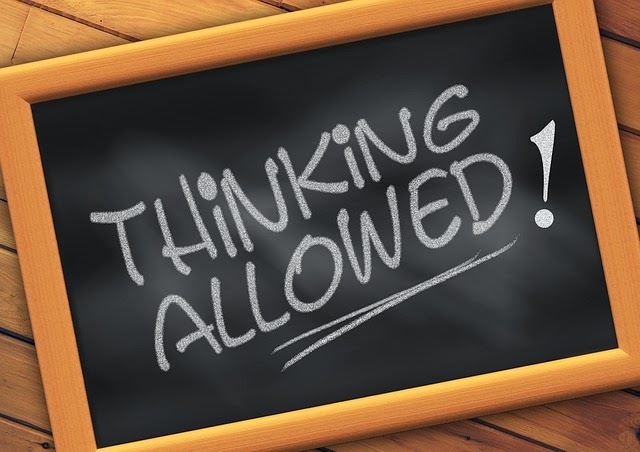 Perhaps, we should spend more time thinking how we can plan to overcome that solvable or unsolvable worry, instead of spending worthless thoughts on it. Come up with a well considered decision after accessing the reasonable aspects of both controlled and uncontrolled factors. End the worry swift. When the man secured his scholarship some years ago, with a decision to relocate for studies in the states. I sank into a sea of emotions, overjoyed for him and at the same time worried about our shift. Life wasn't just the two of us. We had two little ones, who were then 1 and 3. I thought we were too comfortable for any change. I held countless worry of adaption, housing, food, independence and kids! Too overwhelming to be away in a foreign land for 1.5 years. I wasn't ready, and there wasn't a perfect time to. I am so thankful today that we made it and enjoyed our time overseas tremendously. Every single moment of it was memorable. It could have been an opportunity declined because of an uncalled worry. 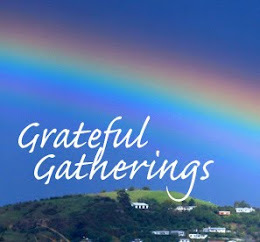 We were outpouring grateful for that opportunity seized and a decision that weighed far more valuable than just worrying. See the bigger picture. No idea what is on your worried mind today, but let's stay worry free. Most often than we thought, worrying accomplishes nothing. Dump out the negatives and pour in the positives. Sometimes, we might need a little more courage, action and affirmation - "Just do it!" 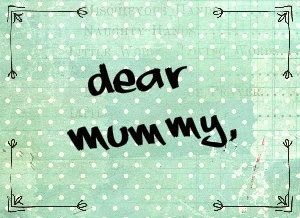 Dear Mummy - Happy Mother's Day! I'm into the 6th year of celebrating Motherhood! It's not always a bed of roses, but I would assuredly say, it's a beautiful journey that I've embarked and never since looked back. There's immersed joy in being surrounded by my two littlest. Last week, I was in their school for a little performance put up by Jare. Jazz's class didn't put up any though. I didn't think it would be anything dedicated to Mummies until a point the daddies went up to dance! My man was out of town and those busy Daddies who made time for practice, put up an extremely enthusiastic show. It was a very pleasant surprise with all the wives kept in the dark. Though my man was not dancing, I was extremely moved. After which the kids presented a little DIY gift to their Mummies. I've since learnt that a packet of tissue should be a permanent resident in my bag. I was so filled with tears that I used Jare's t-shirt as my wiper. Oh, so embarrassing! My little boy has grown so much. He now stands before a group of audience to perform a series of coordinated moves, and did just so well. That must be one of the many reasons I sent him to school. To perform on Mother's day! These are what he made in school and gifted to me. On Mother's day eve, I told the kids, "It's Mother's Day tomorrow, could I sleep in a little longer while Daddy make you breakfast?" They both agreed instantly. I didn't hope too high for that, the agreement sounded too causal. Next day, I woke up to some whispers beside my ears. I overheard Jazz telling Jare, "No, don't wake Mummy up, it's Mother's day. She wants to sleep in." I wasn't dreaming! I heard those words, I've got my sleep deal. I snugged a little longer before deciding to get up. The man was still asleep! Which meant I've unfed kids. Never mind I thought, it's not wifey's day. While washing up, Jazz presented a bag of goodies to me! Nothing exuberant but all self made and sourced within the home. I opened letters upon letters and admired crafts one after another. She had it all prepared a week ago! I'm so blessed to always be reaffirmed by her. I really enjoyed going through every single piece of it. She even hunted down a book and lollipop within the house to gift to me. Not retail sourced, but I was much delighted! The man bought earrings for them to gift me too. 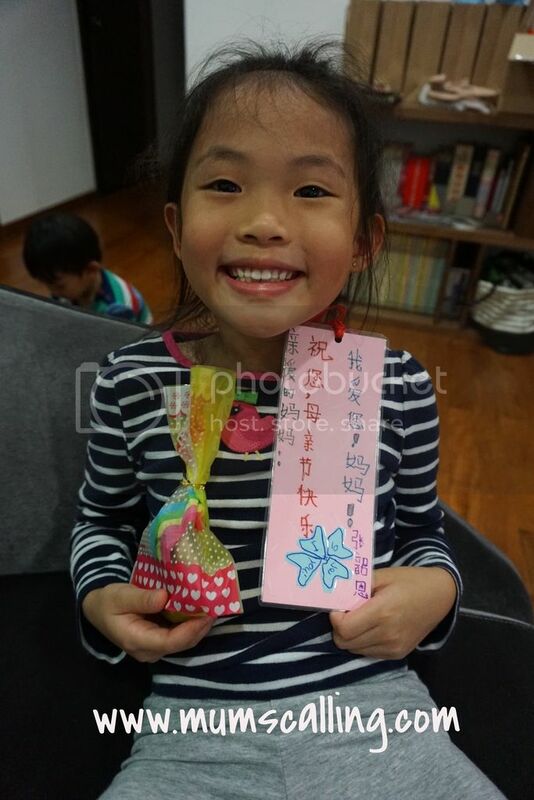 Here's what one of her letters read, "Mummy, thank you for taking care of me and for cooking. you are the best cook ever!! I love you everyday. when you are mad or sad I will always love you. I will always be the girl you like." Another lovely piece, "mummy thank you for cooking for us. You are the one super star. You always take care of me. You are very very pretty and kind and brave. Happy mother day!!!! I love you so so so so so so so much!!!! Grammatical errors? No, I literally melted. It's true when we say it doesn't matter how we look in others eyes, but it matters how we look before our loved ones, especially our kids. Though Jare did not seem independent to come up with something on his own, I do hope his sister has inspired him to get creative along the days. One of the best and most practical gifts they gave were those hand made bookmarks. I lose bookmarks often and I need it to chuck between my readings. Too precious to lose them now. 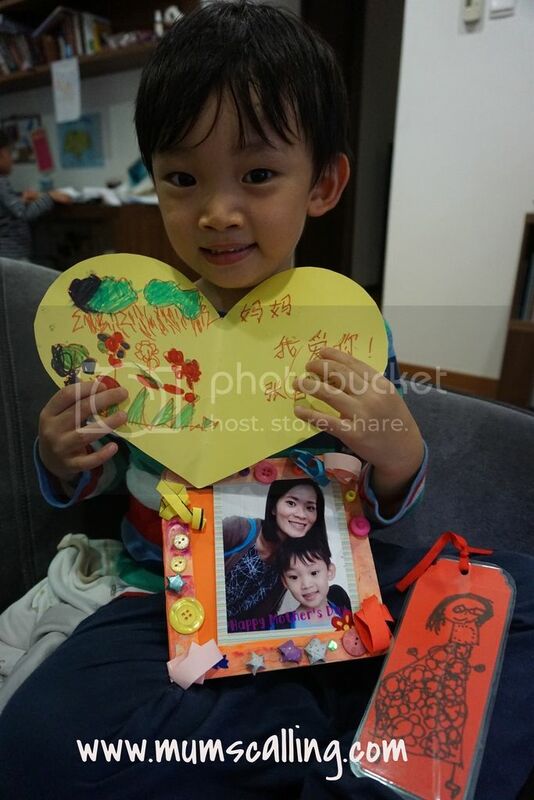 "Thank you little Js for sprinkling my day with extra happiness. I am a low-maintenance Mum, and I had like you both to know I love the way things are gifted, because richness is in love, not in possessions. Great gifts are often in the heart and the thoughts behind it. Self made or bought, it really didn't matter. Even to the day you start getting paychecks, I will be good with hand made. I am contented and most happy watching you both grow in love, in health and showered in great wisdom. Thank you for coming into my life and giving me the everyday reason to celebrate Motherhood!" I hope all Mummies out there, you had a blast too. This post is part of the Dear Mummy blog train hosted by mamawearpapashirt. 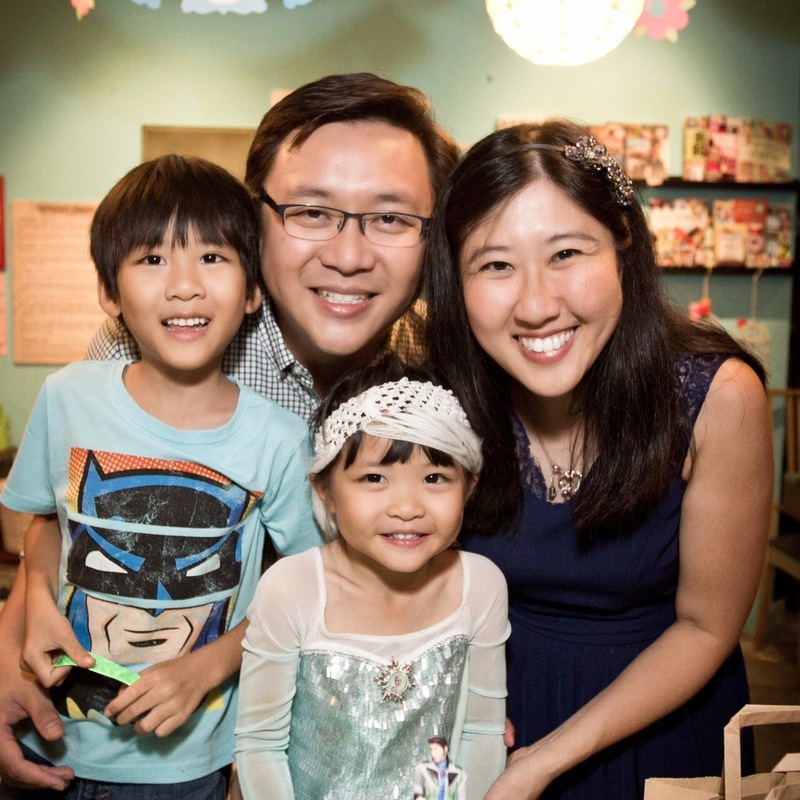 Click here to read what other kiddos have to say to their beloved mummies! Tomorrow, we have Vera on board the blog train. Vera is a don't stay-at-home Mum of two who loves exploring new places with her kids in tow, cooking up a storm and planning theme parties. During her downtime, she writes at Life is in the Small Things, sharing little adventures and everything in between. I met Claudia during my Secondary school days, she was my senior in school. We shared the same extra curriculum, but rarely spoke. It was natural that we didn't keep in touch after leaving school. We caught up again at a friend's wedding in 2005 and found out we were both getting married the next year, 2006. This got us connected and got even more chatty when our first child arrived at about the same time in 2009. She has two adorable boys, Javier, 6 and Jarius, 3. That was also when we started hanging around together. Motherly conversations attract. 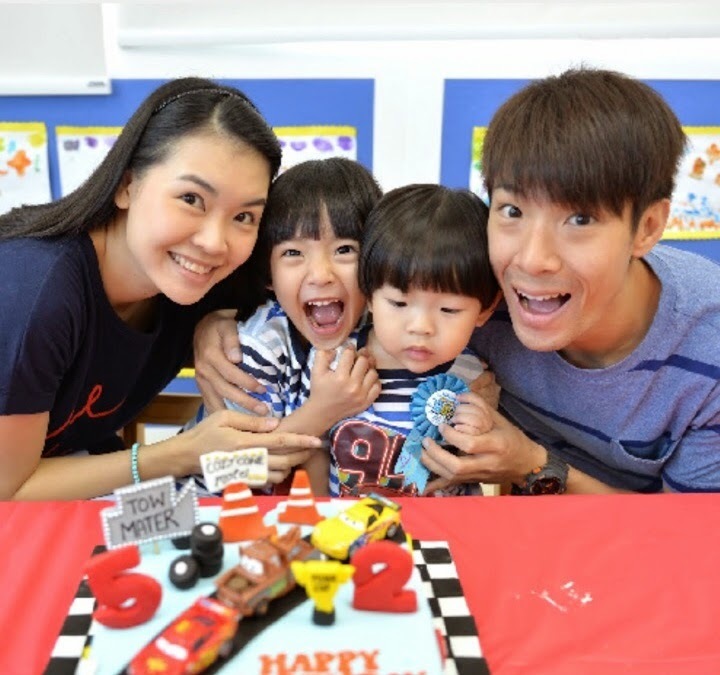 Her husband, local Mediacorp Artiste, Ben Yeo (杨志龙) has been in showbiz for more than a decade. I thought it would be interesting to do an exclusive interview with Claudia and chapter it on the blog. A peek into the woman behind this man's success as a celebrity and a businessman, as well as some family stories. I will say, it's not easy being wife to a man with an irregular schedule. Ben is not just a talented actor, he also has a natural flare for hosting. A model-turned host and actor was talent scouted by SNAP, a popular Channel U reality programme tat aims to seek out young people with idol good looks. He emerged winner with his unique charms. After the births of his boys, Ben divides his time between family, TV work and food business, Tenderfresh Classic. Which we have once tried when we were at onekm. Very impressed with its variety, tastiness and most attractively, reasonably priced with no service charge. That's unmistakeably, my kind of food! It's halal certified too. If you're a chicken wing lover or one who loved Tenderfresh (可爱鸡）from the past, Tenderfresh Classic is a must try. Its creative blend of western mix will definitely tantalize your taste bud. When you're there, you ought to try its succulent chicken steak! Very tasty and lives truly to its name. Tender, juicy and fleshy! He loves his chicken steak! Pictures are really convincing, but not doing much justice to its taste. You have to try it! We love supporting local entrepreneurs and will definitely be back to try more from its menu. Swinging back to the interview, before the drooling begins. Here are the questions I faced up with Claudia. 1. How did you both meet and how did love sparked between you both? "We met at a farewell party organized by a common friend. It wasn't exactly love at first sight. We exchanged contacts and developed our friendship from there. He was an interesting man with a passion in culinary. I was very much attracted to him. There was also an occasion when we both were sharing a cab home and I initiated that he dropped off first. He felt this was a nice gesture from a lady and there was something special. We started dating the same time he entered the showbiz industry. He demonstrated his desires to settle down and was all ready to start a family together. Being a newbie in the industry, fame wasn't the only thing he sought after. There were more meaningful things in life to achieve." 2. Celebrities are often pegged to a hectic schedule. How do you both ensure there's quality time for family bonding? "Whenever he is not working, he would make the effort to send and pick the kids from school. We will sit together for meals and enjoy a good conversation. We strongly believe in building quality time together and so our electronic devices and gadgets are put away during meal times. We are also committed to celebrate birthdays and anniversaries together. Even if it is impossible to arrange something on the actual day, we would do so on a different day." 3. How is a typical family outing like? Do you often get glances or stop for pictures? "Much normal. We wouldn't avoid going to certain places just to avoid attention. 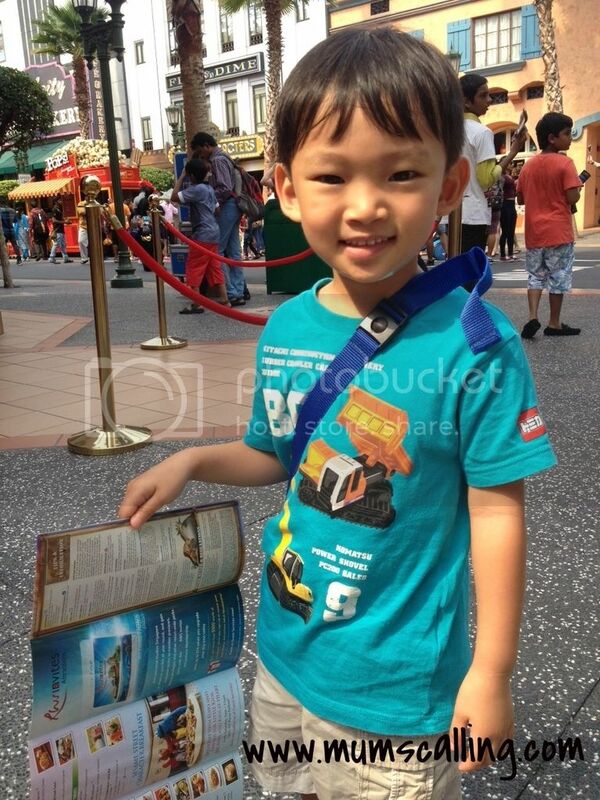 We will travel and explore places we really desire to visit as a family. Occasionally we do get stopped for pictures taking with his fans. But I do prefer Ben is the only one featured on pictures. There isn't an intense paparazzi culture here. We like it this way." 4. Do you feel the need to get yourself and the kids well-dressed whenever you all are out together? "I believe in dressing up comfortably and confidently. I do enjoy dressing up the kids with different outfits as this is a fun stage where they do not mind me putting anything on them"
5. Who takes on the role of discipline in the household? "The Mummy. Ben tries to treat the kids as friends so that he can relate better to them. Ben is hardly around due to his irregular work schedules. We do not like the idea of him coming home to a parade square, demonstrating his disciplinary figure instead of spending quality time with the kids. However he does intervene when things get a little out of hand for me." 6.Tell us your roles in ensuring his success as an artiste and businessman. "I give him my moral support, trust and faith in what he feels right to do. I would also share my opinion when he seeks advice during his decision making process and be there to support him with his final decision even if there were differences. I will manage all the domestic affairs to enable him to have peace of mind and give his best shot at work. I truly understand his work commitments and thus I do not hold it against him for missing important celebrations such as birthdays and anniversaries. That's the mutual understanding we have." 7. How do the boys react upon seeing their Daddy on TV? "They get very excited and beamed with joy as they waved at him! There was an occasion where Daddy appeared on a game show and lost in the game. He was slapped with a penalty of sleeping in an outdoor tent instead of the hotel room. Javier cried buckets and felt so sorry for him. There was much explanation to be done afterwards." 8. what are both your visions for the boys? "I would be most grateful watching them grow up to be strong and healthy, and stay happy always. 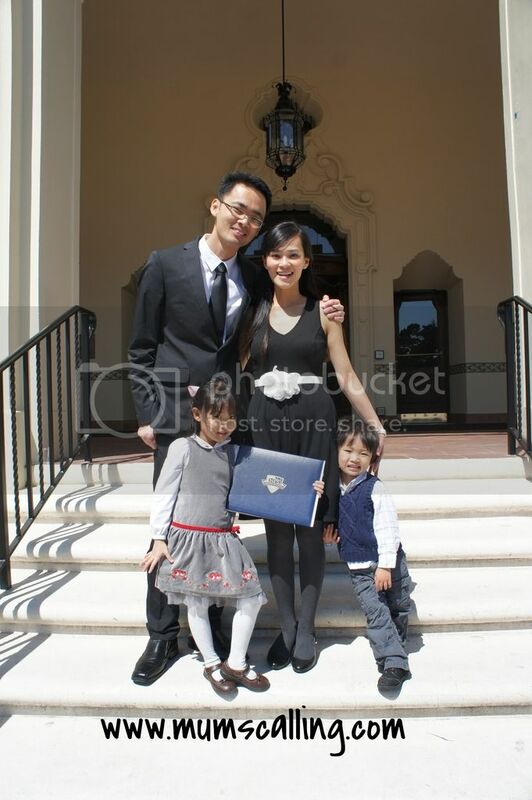 Ben would love them to grow up with good moral values, much more than just excelling in academics." 9. What was Ben like before and after having kids? "He has cut down on attending social events and spends more time engaging in family bonding. He took on heavier responsibilities as a husband and father. He thinks more for the family than for himself. He has became more emotional now than before and is easily moved to tears when he experienced something very touching." 10. What was one of the best things Ben did for the boys? The book offers recipes for babies from 5 months to 5 years old. That's a gift to the boys! A book that puts together the recipes he explored for them. It was the best thing because he wishes the boys will remember that their Daddy loves to cook for them when they were young. And they will in turn use this book for future reference to cook for their kids when they too become a Daddy some day." 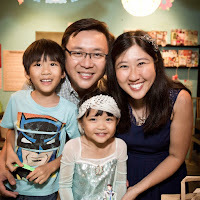 I had a great time chatting with Claudia and it was really fun to be listening to their family stories, this time with the agenda of blogging. Thanks so much for your time, babe! 2. Like and share this Facebook post (Do ensure post is public). 3. Leave me a comment on the Facebook post, tell me a dish you love cooking for your kids. Do ensure that you've completed all the 3 steps to qualify! This giveaway has closed. Thank you everyone, for your participation! A final keeper had been picked with random.org. Congrats Jean T! Winner will be contacted through via Facebook comment. All entries will be verified before the winner is announced. A buddy of ours had recently tied the knot. I got spurred to write some snippets about marriage, from a wife's point of view. Being a wife for 9 coming years, to the same man of course, I've put together love languages of what delighted and will delight me as a wife. Here's for the husbands out there! When the wife explored a new dish for your meal, praise the effort before commenting accordingly. It can be a new milestone to whip up something nice and delicious. Show empathy when the wife shared a hard day about work, relationships or anything disturbing in her day. Assure her that you're on her side, then speak and discuss logic. Give meaningful ideas and suggestions during discussions. The term 'Anything' is not exactly constructive. Oh no no, don't talk to the wife like how you talk to your guy friends. The bluntness and directness may be too overwhelming. When there's indifference, let little things go. Being magnanimous is the trait of a good man. Doing household chores is not just the task of any modern woman, contribute your assistance. Excel in leadership. Don't get too passive, it's a pain to always be kicking logs. In an argument, I had like to say keeping quiet doesn't always signify giving in. When doing meals, help pick food into the wife's bowl. Then feed yourself. Good sense of humour is a man's asset. Keep the laughter going. There is more than one way to do something, explore her ideas too. The wife NEEDS to talk. Be there to engage and listen. Respect her opinions, there's no hierarchy in a marriage. Don't forget, it's still ladies first. Hold the door for the wife. Go to the grocery store often. Cook together! Give the wife some special looks. Lock those eyes! Wipe tears and laugh together. Keep saying the wife's beautiful! Don't stop dating. Have fun. Any contributors to this list or to a list of husband's language? Always a welcome! 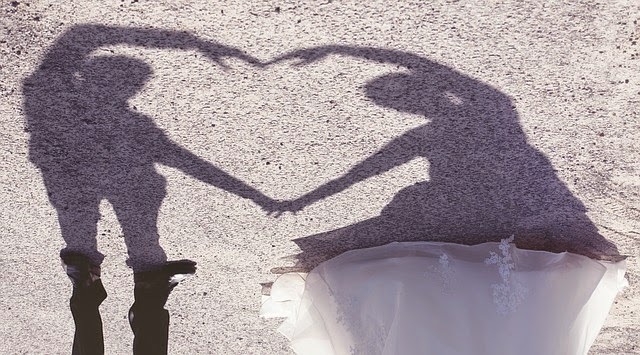 To our newly wedded friends, stay blissfully in love. Don't take too long to procreate! In any stage of marriage, do not forget friends. To my man, I'm blessed to be your chosen one.